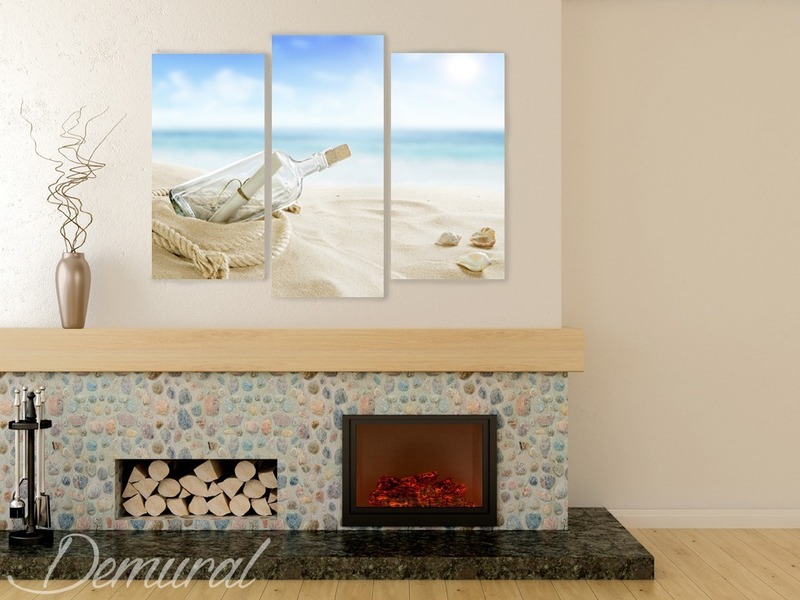 The image of the sea motive relaxes, adds harmony to the room and fills it with unusual, a bit holiday climate. It is worth introducing this visual element to your house or flat if you appreciate this light, pleasant and positive atmosphere. 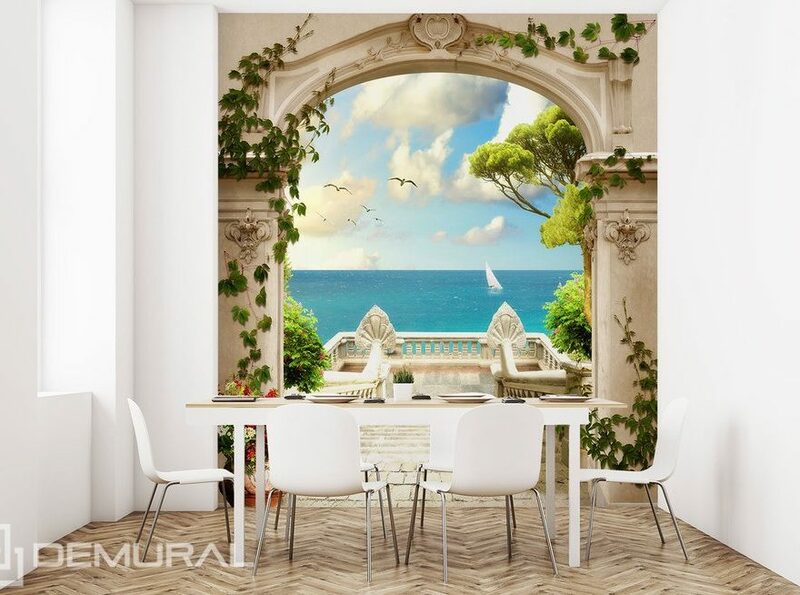 The wall with the sea theme can fit most of apartments. It is best to try it in the light, toned arrangement where it will be a dominant of the composition. How can we correctly adjust this sea theme to our room? It is a child’s play, follow the instructions below and choose the most interesting inspiration. The living room is a place where we spend most of our time during the day. There we invite guests, read books on a sofa, watch films with family or play board games. We should take care of the atmosphere of this room and make it a place where everyone would like to spend time. 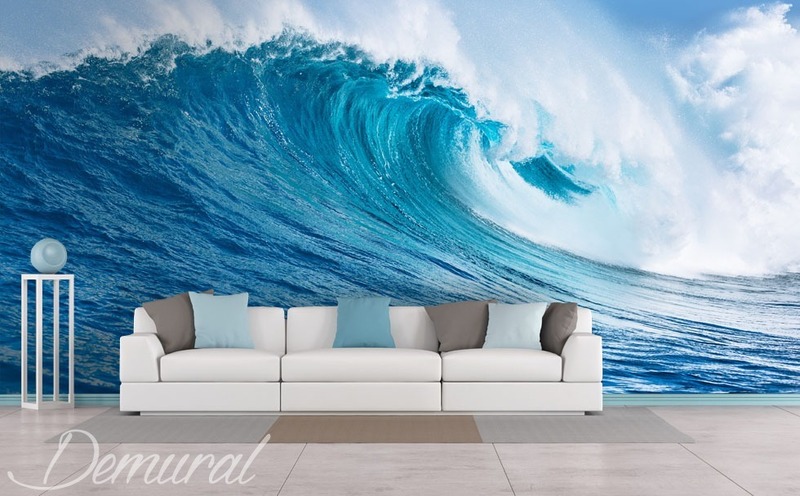 An interesting way to enliven the arrangement of the living room is using a photo wallpaper with a theme of turbulent waves. 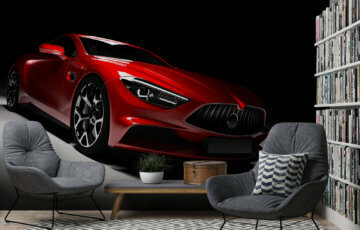 By choosing the light photo full of vivid colours for your wall you can introduce a breeze of freshness, a holiday atmosphere and liveliness to the interior. Such a background would match the leisure equipment in light colours with turquoise, grey or beige decorative elements– generally it will look perfect with elements that are associated with a paradise beach. 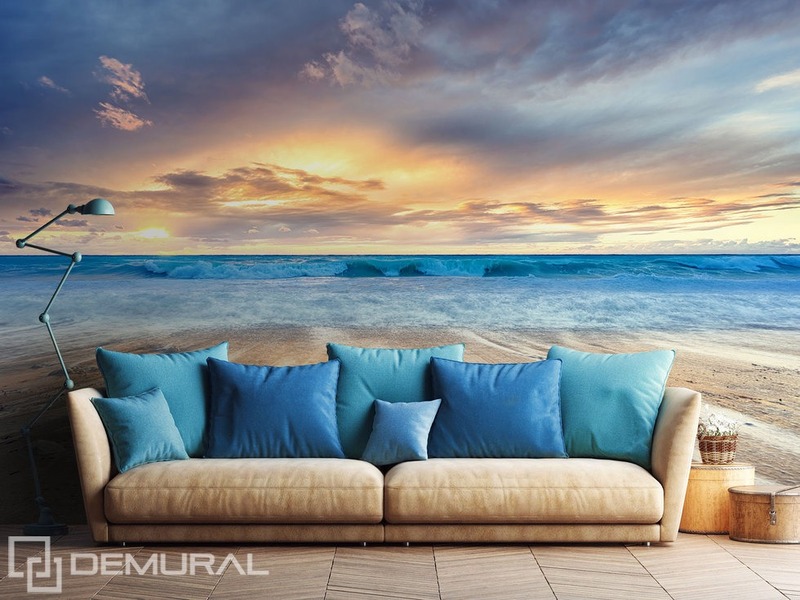 If we appreciate the cozy atmosphere, first of all we should decide to use the photo wallpaper with a view of the beach at sunset. The warm colours of the photo, such as orange, red or pink, will create a friendly atmosphere and will warm the room up. The turquoise colour of the sea motive in the wallpaper will become an interesting colour element that could be used in the form of additions like curtains or cushions. Such an experiment will create a better result if the colour of walls is toned and becomes a properly undistinguished background for more daring decorations. The sea theme in the living room doesn’t have to be only in the form of a wallpaper. If you don’t have enough space, you should try a picture for a wall, e.g. a triptych with a sea theme in light pastel colours of blue and beige. If you want to fill your room with more marine climate, you can try additions of ropes, shells in a jar and a flax as a dominant material to a given room. All of this will build a coherent and attractive wholeness. The image of sea will be perfect also for the bedroom. 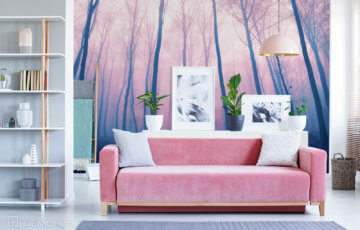 If it is arranged in the toned, natural colours then it is worth trying an interesting photo wallpaper on the wall. Behind the bed that will be an additional attractive addition to the peaceful room and will expose the most important piece of furniture in the room. In the case of a simple room we should try the peaceful sea. Preferably at the background of the sunset which will introduce a peaceful and relaxing atmosphere to the room. 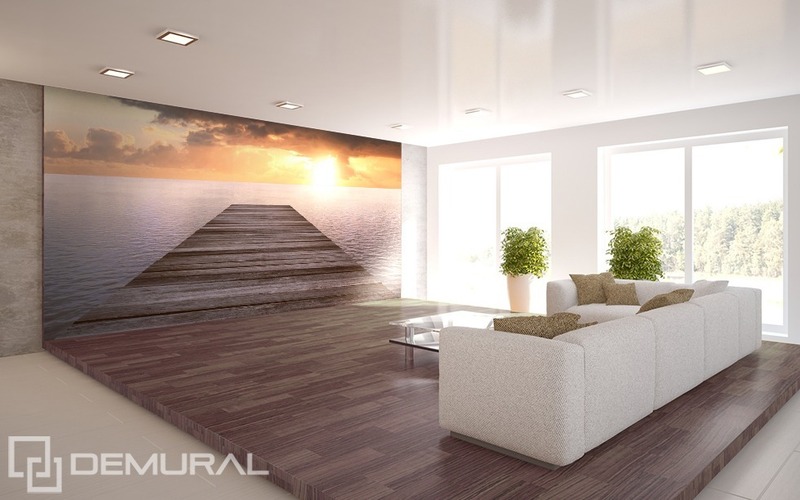 A dining room is a place where in most of the cases we can use the sea motive in a wallpaper on the wall. At such a background we can beautifully present the simple and light furniture, such as a table and chair. This solution is recommended rather for the spacious rooms in order not to minimize the room visually.